Maui, also known as the magic isle, has magical views, water wonders and seaside streets that boast some of the greatest tropical sights in the world. 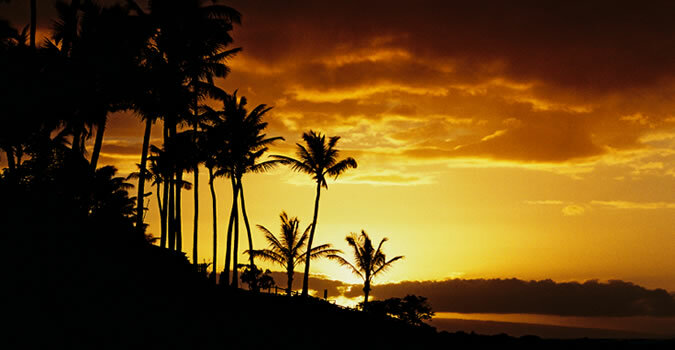 Its scenic roads and sandy beaches attract travelers from all over the globe, making cruises to Hawaii popular. The island of Maui is full of natural beauty and Hawaii cruises make it easy for you to explore it and all its splendor. It has 120 miles of coastline for you to surf, snorkel, walk, ride, windsurf--you get the idea. And they come in all colors: red, white, black. Maui is your ticket to island fun with secret spots, nature's adventures and undiscovered beauty. Maui is an island that offers city, sea and mountains. The streets of Lahaina offer art galleries, history, specialty shops and island eats. It’s a Maui hotspot that's fun for its nightlife and its beaches. Expand your view and catch a peek of miraculous size and wonder of humpback whales. Thousands of them migrate to Maui every year. Looking to catch a colorful sunrise? Watch it from Haleakala National Park that’s 10,000 feet above sea level. Or take the scenic route and discover the road to Hana that weaves you through rainforests, seascapes and waterfalls. You won’t regret it. HawaiiCruises.travel is your ticket to Maui. We specialize in discounted Hawaii cruise vacations. We’ve been helping travelers cruise since 1995. Our rates are competitive, and our customer service staff is knowledgeable and Hawaii savvy. Packages for Hawaiian cruises are available on several of the major cruise lines: Norwegian Cruise Line (NCL), Royal Caribbean, Celebrity Cruises and Carnival Cruise Line. We can help you save money and stay in the budget worry-free. Let us do the work, so you don’t have to worry about a thing — a joy of island vacationing. Book your Hawaiian cruise today by surfing our website at HawaiiCruises.travel or call 1-877-721-8085 for discounted rates plus free onboard credits. We’ll make sure your Hawaiian adventure to Maui is perfect. Your island is waiting.